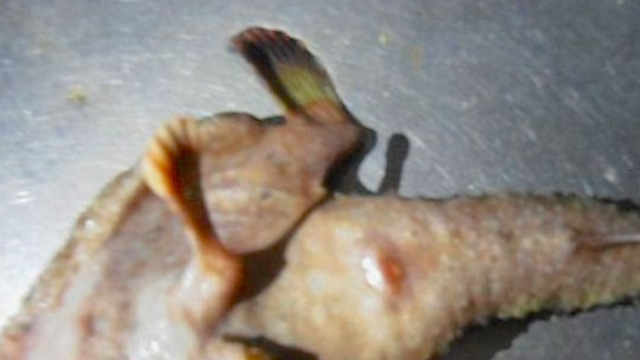 A fisherman caught this horrifying creature with a nose, wings, tail, and feet. Any ideas? The Daily Mail reports that a fisherman named Hope McLawrence on the island of Carriacou in the Caribbean hauled in something unexpected in his net last week. A photo of the creature has been circulating on the Interwebs as people gasp, shriek, and wonder aloud, "What the hell is that?" It kinda resembles a chicken carcass that's been brining in the ocean for a week, but McLawrence insists it had "a perfect human nose immediately above its mouth." There are also wings, a tail, and two feet with toes. Truly horrifying, if there's no explanation. Oh, wait, there probably is. The creature is most likely a frogfish, a lesser known part of God's plan. Judging from what ended up in the fisherman's net, there's a reason frogfish are supposed to stay on the ocean floor.